Owls have played an important role in mythology, often as creatures bringing news to humans. News of death, usually. Because they are very good hunters, and almost always hunt at night, they have been connected with all things dark and scary. In fact, many people still shiver when they hear the hooting of an owl! A much nicer, and friendlier, news-bringing owl is Hedwig, one of the mail owls in the Harry Potter® Books by J. K. Rowling. This is a very good example of using an ancient story, and building it into something completely new! 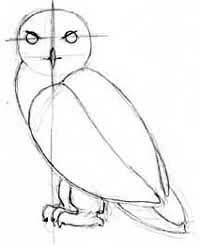 Now let’s learn how to draw a magical owl like Hedwig! The first time we meet Hedwig is when Hagrid buys her from the Eeylops Owl Emporium for Harry Potter’s tenth birthday present. 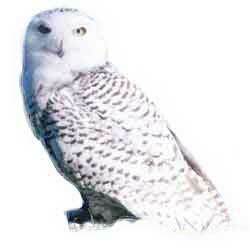 Hedwig is a Snowy Owl, which is entirely different from a Barn Owl or a Hoot Owl or any other sort of owl. And owls are very particular on that point. I checked for sites on Google.com (using the tips that you’ll find in the Serpent chapter), and found out that Snowy owls live in the Arctic. They are white with black spots in the winter, and brown in the summer. Putting Hedwig in a bird cage will pose some interesting challenges. 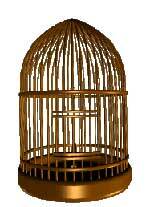 I found a picture of a very nice brass bird cage. You can see that if we put all those lines in front of our owl, she would get totally lost. So we need to practice making some sketches of bird cages that have more room between the bars. 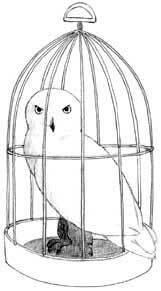 If we practice drawing the cage before we draw our owl, we will be less apt to ruin our drawing. The hard part about the birdcage is the ovals at the bottom and around the middle of the cage. A circle seen from the side becomes an oval, and it will change from skinny to fat, depending on where our eyes are, in relation to the circle. To see what I mean. Go get a glass from your kitchen, and put it on the table in front of you. Look at the oval shape at the top, around the rim of the glass. Then slowly raise the glass to eye level, and watch it get fatter again. If these shapes are not drawn this way, with the fatter oval on the bottom and the thinner one in the middle of the cage, the cage sill not appear to have any volume. Flat. By looking at the photo at the top of the page, we can see that our owl’s head is almost, but not quite, round. Her eyes are a little above the center line – and spaced quite far apart. Now that we have a rough sketch, we can erase our extra lines and rough in the shadows. We shouldn’t draw very darkly, because we will need to erase any part of the owl that falls behind the bars in our cage. Now for the scary part – we have to draw the cage over our nice owl. We have our practice sketch of the cage to help us. We will draw the lines very lightly, and make sure none of them cross over the eyes or beak on the owl, because that wouldn’t look good. We’re almost done now. We just need to make the shadows more pronounced, and add the Snowy Owl’s spots. We could also decorate the bottom of her cage, if we wanted to. 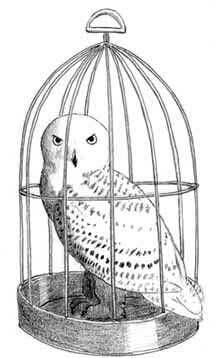 This time, I think I’ll leave it plain, but a Wizard’s owl might have a fancier cage than this. Celtic runes might be nice, or hieroglyphics from ancient Egypt. I’ll bet we could find some nice ones if we searched on the Internet. 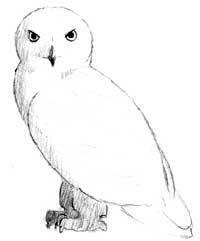 I think Hedwig would be happy with her portrait, don’t you? Be sure to do some research about owls and their place in the World of Magic on the Internet, and in your library. One excellent book that shows the historic role owls have played in the world of humans (although it is a dark, and somewhat scary book, meant for adults), is Sherman Alexie’s Indian Killer. 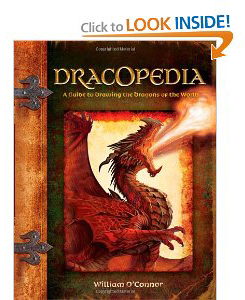 If you’re old enough, I highly recommend this book. I hope you’ll do some research to find other species of owls to draw too. Each one of has interesting features that will look beautiful in your drawings.